I had the chance to sit down for a few minutes with California’s top air regulator today. 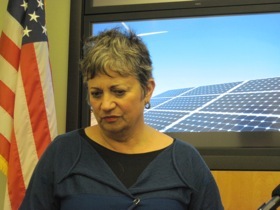 Mary Nichols, who chairs the state’s Air Resources Board joined us by satellite from Sacramento. The seven-minute interview will air on KQED’s This Week in Northern California, Friday evening. On Wednesday, blogger Jon Brooks posted a call for questions on “News Fix,” the KQED News blog. It was a worthwhile experiment but the results speak to the extent to which Nichols has become a lightning rod for opponents of environmental regulation in general and cap & trade in particular — and to some degree the state of public policy discourse in America today. The comments, some emailed and some posted on the comments thread at News Fix were largely a stream of invective directed at Nichols and the Air Board. Some questions were a bit technical for a seven-minute TV interview. Others were valid but off-topic. As the latest installment in our series of “Climate Watch Conversations,” I tried to keep to the climate-related business of the Board (with one exception: I felt I needed to have her address events unfolding in Japan and concerns here about radioactive drift). You can hear all of her answers in the video segment posted on the This Week site and below. Answer: She walks to work (in Sacramento, though she confesses to driving when she works in Los Angeles). I wonder if that was Taggart’s guess. In retrospect, I would say this was a worthwhile experiment but I don’t think I’d repeat it for an interview of such short duration. I could’ve bypassed your comments and pursued my own line of questioning, as journalists typically do. Or I could have ignored the extraordinary crisis unfolding in Japan and its potential implications here. Neither seemed like a good choice. The brutal time constraints of television meant that readers and I were both shortchanged in terms of questions we’d like to have answered. We’ll learn from this and pursue a longer format for the next one. Explore: Government & Business, California Air Resources Board, CARB, Mary Nichols. Craig, this is a good set of comments. Personally, I have always faulted Nichols, not for doing too much regarding controlling climate and CO2 but rather for doing too little regarding the health effects of bad air quality in the San Joaquin Valley. My question would have been whether the failure to achieve acceptable improvements there is a sign of the fate of AB 32 regulations. Thanks, Wes. If it’s helpful, we are preparing a radio backgrounder on issues that the “environmental justice” community has with AB 32. The setting is not in the Central Valley but we hope it will illuminate some of the distinctions between greenhouse gas emissions and “local” pollutants of the sort that pose more immediate health risks to individuals. That report, by Alison Hawkes, will air soon on The California Report. Has ARB PZEV standards generated any Smog Check repairs? AB 2289 ENG may protect cars from failing Smog Check. AB 2289 Eng may increase cars, use of oil and car sales. A 30 second phone call to DCA/BAR Chief Sherry Mehl can save $billions and prevent thousands of tons of air toxics. I’m still confused as to why Ms. Mell does not seem to care if smog check faults get fixed. Has John Wallauch applied to the Governor for appointment to CA/DCA/BAR Chief? Valley Clean Air Now, vrrrm, with its partner Chevron, never finds out if if what is broken on a Smog Check failed car gets fixed, just promoting more cars. The “Green Jobs” here in southern Cal are leaving because of all the permits, rules, codes and other hoops to jump through, Hydrogen maker in Chino moved the company along with 800 jobs to Florida, “Green Jobs”. I believe Mrs. Nichols and company are only justifying their high paying jobs with this farce.